The Board dismissed a petition for cancellation of a registration for the mark MOMBACHO for cigars, ruling that Petitioner had failed to prove its claim of abandonment. The Board rejected petitioner's contention that respondent Tropical Tobacco's meager sales were merely token sales that did not qualify as bona fide use of the mark. Mombacho Cigars S.A. v. Tropical Tobacco, Inc., Cancellation No. 92062543 (July 6, 2018) [not precedential] (Opinion by Judge Cindy B. Greenbaum). Section 45 of the Trademark Act provides that a mark shall be deemed abandoned "[w]hen its use has been discontinued with intent not to resume use ...." Nonuse for three consecutive years is prima facie evidence of abandonment. "Use of a mark means the bona fide use of such mark made in the ordinary course of trade, and not merely to reserve a right in a mark." Petitioner had the burden to prove abandonment by a preponderance of the evidence. It presented testimony declarations of its president, of the president of the "largest cigar shop in the country," and of a cigar sales broker, all asserting that they were not aware of respondent's use of the mark MOMBACHO. Petitioner contended that respondent has a practice of "warehousing dormant marks," and it questioned the "bona fides of [Respondent's] de minimus (sic) sales from 2010 through 2015." Respondent's President testified that sales of MOMBACHO were continuous since 2004, although sales dropped after 2010. Respondent's office manager confirmed that MOMBACHO has been sold continuously, every year. 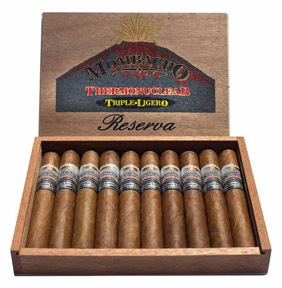 Since about December 2015, respondent has sold MOMBACHO cigars exclusively to Serious Cigars and "now that we've done an exclusive with Serious, we hope the product really picks up." Respondent's President admitted that the brand had not been actively promoted since 2010 and did not appear on the company's website from 2010-2015. It was not a "popular" cigar brand as of 2014. Respondent submitted invoices of sales to retailers for each year from 2005 to 2016. Beginning in 2012 (the appropriate starting point for considering abandonment with respect to a use-based application filed on January 10, 2012) the invoices demonstrated sales of between two and four boxes of twenty cigars each year to Serious Cigars. Seven weeks after the petition for cancellation was filed, respondent sold 24 boxes to Serious, and then 300 more to Serious, under an exclusive agreement to retail the product. The Board found that there was no period of three consecutive years when Respondent did not sell MOMBACHO cigars. While Respondent’s sales from 2010 to 2015 were admittedly slow and made virtually exclusively to one client (Serious Cigars), nothing in the record supports a finding that such sales were not “bona fide use[s] of [the] mark[s] in the ordinary course of trade,” rather than “made merely to reserve a right in [the] mark[s].” 15 U.S.C. § 1127. In other words, contrary to Petitioner’s assertions, the record does not support a finding that Respondent’s MOMBACHO mark was dormant or part of a purported trademark warehousing program. On the other hand, such near exclusivity would explain why Petitioner’s witnesses were not aware that Respondent was selling MOMBACHO cigars. Finding that petitioner had failed to establish abandonment by a preponderance of the evidence, the Board dismissed the petition for cancellation. TTABlog comment: De minimis non curat lex? Not this time. Note that respondent asserted a first use date of 2004 in its application. However, the period of time before filing was irrelevant to the abandonment issue; the question was whether the mark was subsequently abandoned. Granted, I have not read the record and am relying upon your summarization of the sales history. That said, funny how in 1988 the Trademark Law Revision Act was supposed to end with a thud “token sales” of goods being considered “bona fide use in the ordinary course of trade”. Even funnier how Judge Leval in 1979 under pre-TLRA gutted Procter & Gamble’s minor brands program (and cancelled their registrations) that had significantly more sales than those in this case. (I was there.) Allowing the maintenance of such registrations with their national presumptions is not good policy. This case demonstrates why most lawyers are loathe to recommend that a client who sees an unused registration file a cancellation action in the TTAB to clear the mark. It is expensive, time consuming and you can wind up with this result if you get a panel who is not willing to find this type of use contrary to the intent of the TLRA. De minimis non curat lex? Maybe it depends on whether the goods are something other than cigars or rum? Or maybe its the name? "Mombacho" is the name of a volcano in Nicaragua. The last eruption occurred in 1570, deminimus evidence of volcanic action, but never the less still a volcano.